GEO ExPro - Senegal Revisited. In 2010 we reported that after over 50 years of exploration, Senegal had only delivered a number of small fields and produced 11 Bcf of gas, but was still waiting for the big discovery which would help fuel the country’s growing economy. We asked the question - does the prize lie in the deepwaters? In 'Senegal Revisited' we look again at this exciting country, at a time when answers to some of those questions may be about to be made. In Vol.7 No. 4 we took you on a tour of Senegal, a country recognised as containing great hydrocarbon potential. After more than 50 years of exploration, Senegal had only delivered a number of small fields and produced a few Bcf of gas and was still waiting for the big discovery which would move the country into the major league of oil producing nations. Back in 2010 we asked the question - Does the prize lie in the deepwaters? In 'Senegal Revisited' we look again at this exciting country, at a time when an answer to that question may be about to emerge. With news of big success' offshore in deepwaters, we give you the chance to read again this article from 2010. Later in the year we plan to bring you a further update on Senegal. Until then we hope you enjoy this review. The first seismic surveys in Senegal, both on and offshore, were undertaken in the 1950’s, and hopes must have been high in 1954, when the very first well drilled onshore had gas shows. Over the next few years several minor gas discoveries were made, including the Diam Niadio field, which produced 7.6 Bcf of gas from 1961 until it was shut-in in 2000, but nothing of real significance was found. This pattern continued as onshore exploration slowed down over the next decades, with only small marginal discoveries, mostly in the vicinity of Dakar. These included Petrosen’s 1997 discovery, Gadiaga, about 60 km north-west of Dakar. Offshore seismic exploration also started in the 1950’s, but the first offshore well was not drilled until 1966, in the Casamance region in southern Senegal, south of The Gambia, the country which almost splits Senegal in two. In 1967 the Dome Flore field was discovered in this area, containing an estimated one billion barrels of heavy oil which has yet to be exploited. Senegal lies in the centre of the MSGBC (Mauritania - Senegal- Gambia - Bissau - Conakry) Basin, which covers much of the west coast of West Africa, extending from the ancient Reguibat shield in north-west Mauritania to the Guinea fracture zone in the south. This is a passive continental margin basin, much of it offshore, with the widest onshore part in Senegal. It can be divided into a number of sub-basins, including the Senegal Basin, and has substantial thicknesses of Mesozoic and Tertiary sediments overlying older Palaeozoic rocks, which in turn overlie Precambrian basement. The historic Île de Gorée, an easy day trip from Dakar, is a calm oasis away from the bustle of the capital, but the tranquil, bougainvillea clad streets hide a dark history, as it was the main export centre for the slave trade in the area. (Source: Jane Whaley) Senegal is a land of rolling deserts in the north and lush tropical forests to the south. It has long stretches of white coast with charming fishing villages, vibrantly contrasted by the bustle of the capital, Dakar, with its busy markets and exciting nightlife. Quiet Saint Louis, the original capital of French Western Africa, is different again with its French influence and urban culture, while in the deltas of Casamance, bird watchers are drawn to Senegal’s vast array of bird species. Senegal attracted many European colonisers, including the British, French and Dutch, who fought for strategic points from where slaves could be exported. By the end of the 19th century, France had secured the whole of the country, and Dakar was built as the administrative centre. Senegal secured independence in April 1960, part of a federation with Mali, but soon became a republic under the presidency of the socialist and poet Léopold Sédar Senghor. His time as President was characterised by the development of African socialism, which drew heavily upon the négritude philosophy, a literary and ideological movement which opposed colonialism and demonstrated an acceptance and pride in African history, traditions and belief. Despite an ongoing separatist rebellion in Casamance, Senegal is known as one of the most stable democracies in Africa, with a history of peaceful leadership and civilian rule. It has a lively political scene, where parties compete across ethnic, ideological and religious lines, and remains one of Africa’s only countries not to have had a coup, and to always have a peaceful transfer of power. Senegal is well known for its musical heritage, and Sabar drumming is particularly popular. The ancient tradition of the ‘Griot’ - musicians who memorise the region’s oral history and pass it on to future generations - has been recorded back to the 13th century. Senegal’s national flag symbolically sums up the country’s values. The green band stands for Islam, progress and hope, yellow signifies wealth, the red demonstrates sacrifice and determination and the star shows unity. Potentially, the most important contribution these older rocks provide is as excellent source rocks, particularly in the Silurian Buba shale. This bears strong similarities to the North African Lower Silurian Tanezzuft Formation, the prolific source for many accumulations, such as Hassi Messaoud in Algeria. The oil-prone graptolitic Buba shale may be as much as 400m thick with TOC contents of 5.5% in the southern region of Senegal. Maturity levels vary, and would appear to be dependent on the presence of later intrusions or high geothermal paleogradients close to major thrust zones. An additional Palaeozoic source is thought to be the Upper Permian to Lower Triassic lacustrine shale that underlies the thick syn-rift salt unit. This section does not outcrop in the Senegal Basin, and drilling has not penetrated it, so it is completely unexplored at the moment. 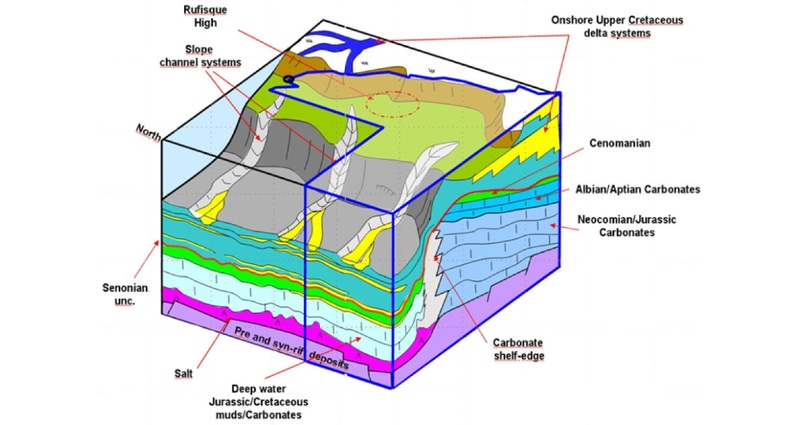 The Palaeozoic contains many sandy potential reservoir horizons with good porosity, and the hydrocarbons may also have migrated up dip and along faults into younger rocks. The Mesozoic rift basin developed as the Atlantic formed and America and Africa separated in the Late Triassic. The syn-rift does not outcrop in Senegal, but is represented offshore in the southern Casamance region by widespread evaporite sequences which have developed into large salt diapirs. The central Senegal Basin has a thinner syn-rift section, probably consisting of continental clastics and organic-rich lacustrine shales, which is only thought to be present in the western part of the country, buried to a depth of over 4,000m. As rifting continued in the Jurassic and Early Cretaceous, large volumes of carbonate sediments built up into a wide platform, increasing in thickness from east to west across the Senegal Basin. These form one of the main, although underexplored, reservoir horizons in Senegal, showing porosities of between 10 and 23%. They are overlain by thick marine shales - good seal horizons - interbedded with marginal marine sand stones, deposited after the Atlantic opened and the land was inundated. As the Cretaceous transgression reached its greatest extent in the Turonian, about 90 MA, a widespread layer of black shales, 50 to 150m thick, often bituminous, were deposited. These form an important hydrocarbon source in the Senegal basin, especially in areas such as the Casamance region where salt diapirism has resulted in a high geothermal gradient, or offshore Dakar, where later volcanism has had a similar result. Turonian shales form the source for the 80 MMbo Chinguetti field, offshore Mauritania. Potential traps in the Mesozoic-Tertiary Senegal Basin are varied, and include salt-related structures, growth faults, slope truncation traps along the present shelf edge, structures related to intrusions, Mesozoic pinch-outs and Lower Cretaceous-Jurassic carbonate bank plays along the shelf edge and slope. Many of these remain to be explored. Rogers Beall, Fortesa Managing Director, and Mamadou Faye, Exploration Manager, have high hopes for the future of the Senegalese oil industry. (Source: Jane Whaley) “We have such faith in the potential of Senegal that we formed an oil company just to exploit it,” explains Fortesa International Managing Director Rogers Beall. “We have been involved in the country since 1991, originally promoting data packages, and when Petrosen made the Gadiaga discovery, we joined them as operator. We formed our own Senegalese drilling company, and are now drilling our eighth well on the field. Four of these are producers, with the original well, Gadiaga 2, onstream since 2001. Fortesa employs about 200 people, the majority of whom are Sengalese, including a number of young geologists and geophysicists, who are being trained not only in the field but also to use the most modern of computer interpretation and modelling techniques. Petrosen is encouraged by the fact that companies have begun to show renewed interest in Senegal, and there has been an increased uptake of acreage, particularly offshore. The first deepwater drilling in the region is actually due to commence early in 2011, when Ophir Energy will drill the Kora prospect in 2,600m water depth, in the AGC Profond PSC, an area jointly administered by Senegal and Guinea Bissau. The prospect is a large four-way dip closure with Late Cretaceous reservoir potential, estimated to contain over 400 MMboe recoverable. According to Ophir’s partner Rocksource, the prospect was substantially upgraded after CSEM analyses, and the chance of success for the well is now estimated to be above 50%. Seismic records show deepwater turbidite sandstone reservoirs and a complex structural history with dynamic salt, and the area contains multiple play intervals and has 17 prospects mapped within its limits. “In Petrosen, we believe that Senegal has excellent hydrocarbon potential both on and offshore, and we are looking forward to a promising future,” Joseph Medou concludes. 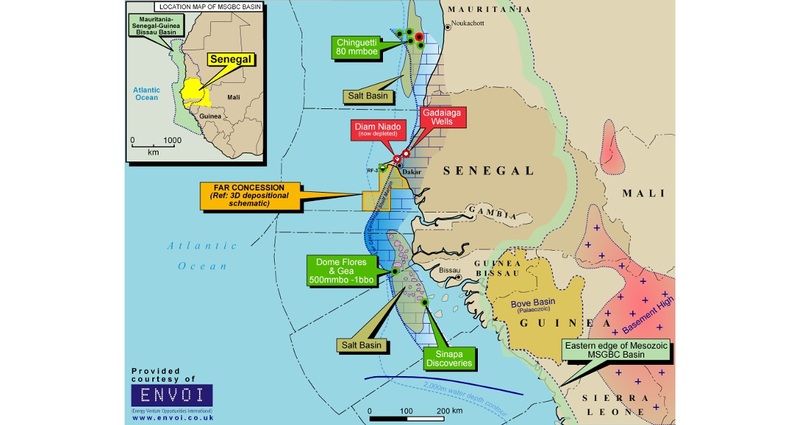 News in October 2014, that Cairn Energy and partners had discovered oil with the FAN-1 exploration well, offshore Senegal were greeted with great joy not only in Dakar but across the region and the industry as a whole. The well, located in 1,427 m water depth and approximately 100 km offshore in the Sangomar Deep block, reached a Target Depth (TD) of 4,927 m, targeting multiple stacked deepwater fans. Preliminary analysis indicated 29m of net oil bearing reservoir in Cretaceous sandstones. Furthermore, no water contact was encountered in a gross oil bearing interval of more than 500m. With initial gross STOIIP estimates in the range of 250 MMbbl (P90), 950 MMbbl (P50) to 2,500 MMbbl (P10) maybe this is the big one that Senegal has been waiting for? Fast on the heals of the success of the first well in the campaign and Cairn announced the success of their drilling at the SNE-1 well, located in 1,100 m water depth and approximately 100 km offshore in the Sangomar Offshore block and targeting the Shelf Edge Prospect. Intermediate logging of the SNE-1 well confirmed hydrocarbons in the Cretaceous clastics objective, of similar age to oil bearing sands found approximately 24 km away in FAN-1. Initial analysis of the SNE-1 well indicated, 95m gross oil bearing column with a gas cap and excellent reservoir sands with net oil pay of 36m. Preliminary estimates of the Contingent Resource ranged from 150 MMbbl (P90), 330 MMbbl (P50) and 670 MMbbl (P10) recoverable. With distinct oils types ranging from 28° API up to 41° API indicated, from a number of oil samples recovered to surface from both wells, it seems that issues around heavy oil have been resolved? Plenty of hydrocarbons have been found in the East African Rift system, but Malawi, lying at its southern end, is virtually unexplored. Where in the world can you still find undrilled billion barrel prospects? Iraqi Kurdistan is one answer. But what is it like to work in an area thought by many to be a war zone?